Like Jellycat? Click here to view the entire range. Poppet is an adorable little sheep. He loves to skip around and play all day amongst the pastures with his friends. He makes the perfect pushchair pal for tiny tots. 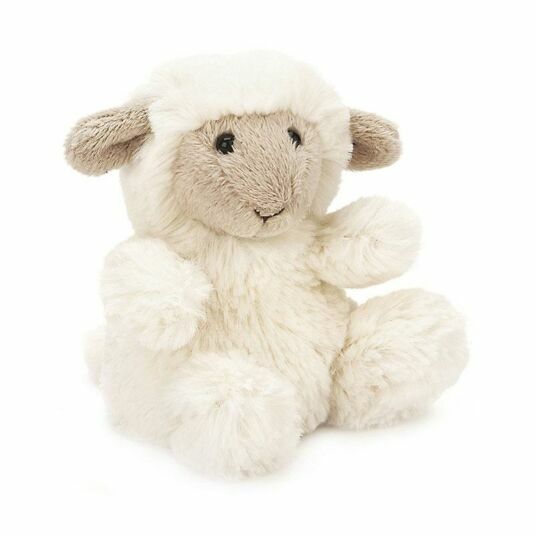 With his dainty hooves, soft ears, woolly cream fleece and beady black eyes, how can you resist his playful charm?! This huggable pocket companion is sure to be loved, making him the perfect playtime partner for Easter, birthdays and Christmas. Jellycat themselves give specific care instructions for all their products: Lots of love. If you’ve ever seen a Jellycat product on the shelf and resisted picking it up – or at the very least letting out an “aww” – then there’s probably something wrong with you. Established in London in 1999, Jellycat is one of the world's leading luxury soft toy companies, and it’s easy to see why. Designed with care and flair in England, their high quality soft toys are sold all over the world. In fact, this relatively young company is now a genuine market leader, famous worldwide for their cute, cuddly, and always innovative products. Hip and humorous, soft and sumptuous, Jellycat soft toys have been called "the world's most sophisticated soft toys", and of course they all exceed both American and European safety standards. Each year, Jellycat introduce the world to hundreds or new products, displaying a willingness to continue evolving and keep up to date with the changing fashions. For a relatively young company, Jellycat have already made an awfully big name for themselves.